Fabric bins. Or tupperwares, boxes. Or for the luckiest, entire rooms with shelves. In my case, overflowing drawers of fabric in the top half of a folk art dresser. 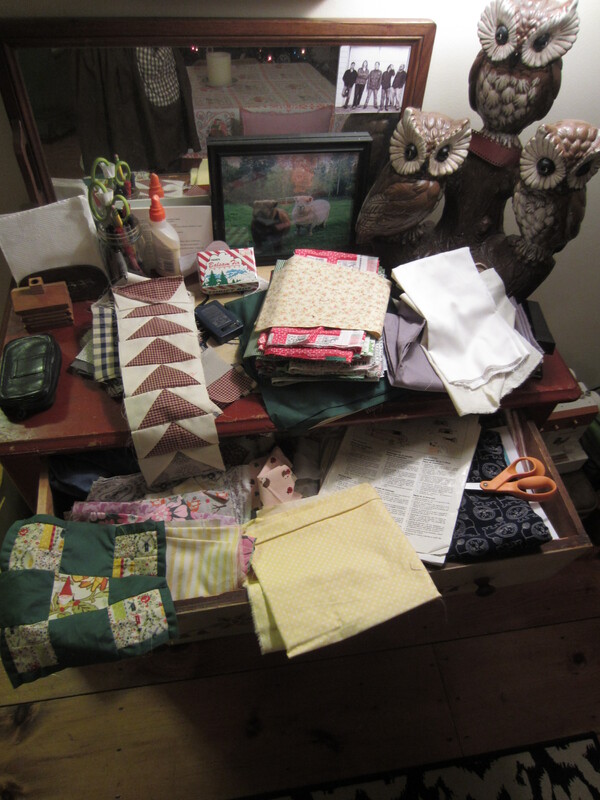 By December, I have assembled a hodge-podge squirrel’s nest of test blocks, unused fat quarters, thrift store fabric finds, and the practically useless, tiny bits of quilt scraps. Only two-and-a-half years into building my own fabric nest (*ahem* I mean, mess), I already have bits of fabric that I’ve grown too attached to; fabric that I don’t want to use because that means cutting into the pattern & maybe giving it away to someone else. It reminds me of a childhood sticker collection: those few fuzzy dog stickers that I just couldn’t part with, so remained on the waxy sheet for eternity. I admit, the Gollum-like hoarding of these “Precious”-es is not very Gift Fox. 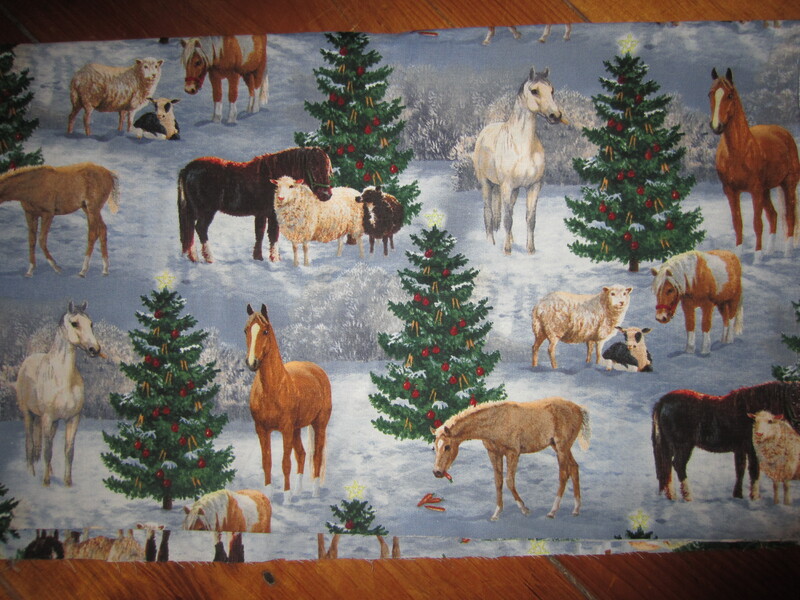 I just can’t help but have this gnawing feeling that no one could love this piece of Christmas fabric of ponies & sheep gathered around a Christmas tree as much as I do. At JoAnn’s this Sunday, picking out border & backing material for the Flying Geese quilt, I was engulfed by the typical weekend crowd: older women clutching their paper deli number ticket and exasperatedly leaning on their carriages. I am learning to like JoAnn’s — their coupons certainly help — but I miss the library-like presence of the Keepsake Quilting store that I grew up near. At Keepsake, you could mill around the gloriously high shelves of fabric bolts, be inspired by the hundreds of handmade quilts on display, and get your fabric cut clean with rotary cutters not plain ol’ fabric scissors. But, like Keepsake, JoAnn’s doesn’t disappoint with their fabric counter staff. One particular woman, Rosemary is my favorite. She is built like a bird with a swatch of grey hair and long, spindly fingers. It seems she knows everything there is to know about sewing and quilting. Rosemary confessed to me that she has held onto a piece of fabric for over 20 years because she just can’t bear to cut into it. “It’s got James Cagney, Katherine Hepburn… all the great movie stars… you can’t find fabric like that anymore!” She went on to say that maybe someday she’ll make a classic cinema quilt. Maybe. Someday. The other woman running the fabric counter chuckled, saying, “Rosemary, your daughter’s going to inherit that two yards of fabric and either make it into pillowcases or chuck it!” And they both laughed then because it seemed true. 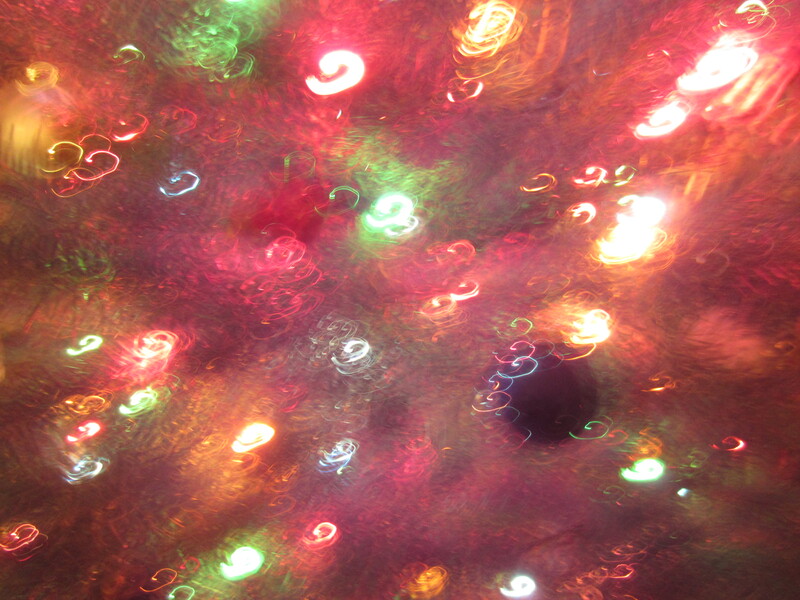 I am readying myself for a marathon Christmas crafting session. Last year, I used a good portion of my fabric scraps to create some sweet tote bags as Christmas gifts. This year, I’m making zipper pouches. (In true Jess math fashion, I bought 10 zippers that are each 5″ shorter than needed. Perfect.) 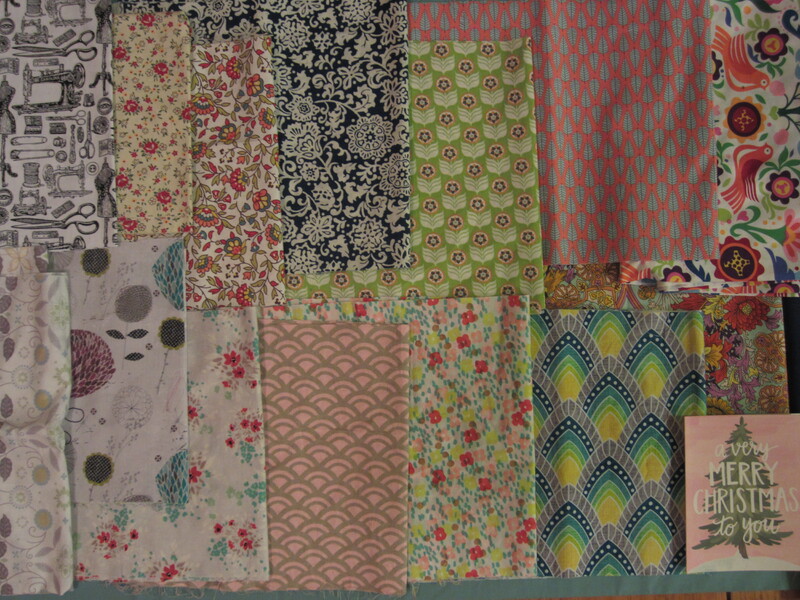 I was supposed to be using fabric scraps again, but, alas, JoAnn’s had some gorgeous prints that I could not pass up. So, all of those precious pieces of fabrics nestled in my bureau? 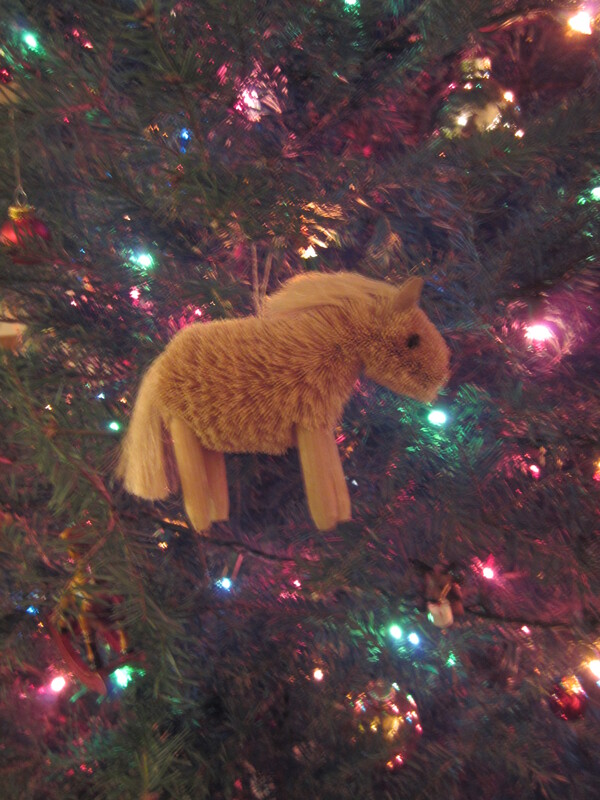 I guess, they’ll line this squirrel nest until I’m good + ready to make my own ponies & sheep & Christmas tree quilt.